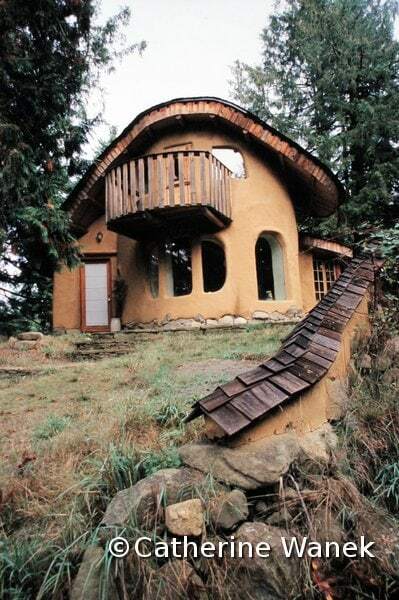 Cobbers today use the sculptural nature of cob to good advantage. This gorgeous home in British Columbia is by Cobworks. Cob is one of the simplest and most ancient building systems in the world. It has been used extensively throughout much of Europe, Africa, Asia, and pre-Columbian North America. The word “cob” comes from England, where the technique was common until the 20th Century. In the county of Devon alone, there are more than 10,000 cob homes still inhabited, some of them over 500 years old. Starting with sticky clay soil, you add water, usually sand, and straw. There are many mixing techniques, ranging from bare feet on a tarp to mortar mixers and backhoes. Once you have a homogenous mixture, firm but plastic, you use it to sculpt the walls in place. There is no formwork required and usually no reinforcement other than the straw. This allows for very curvaceous sculptural forms. 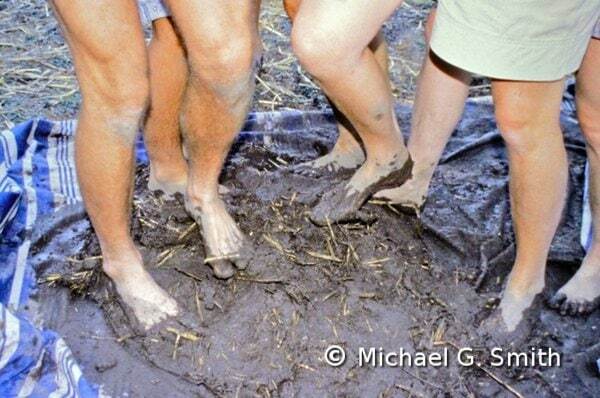 One way to mix cob: friends + feet + mud = fun! For much more information on building with cob, including complete detailed instructions, design ideas, and many illustrations, read my book (co-written with Ianto Evans and Linda Smiley of the Cob Cottage Company) “The Hand-Sculpted House” (Chelsea Green, 2002).